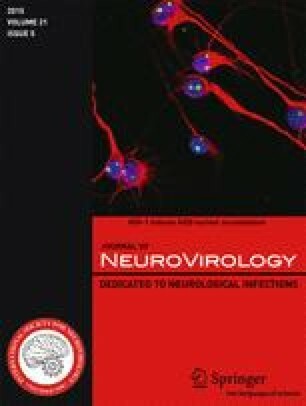 Several data indicate that neuronal infection with herpes simplex virus type 1 (HSV-1) causes biochemical alterations reminiscent of Alzheimer’s disease (AD) phenotype. They include accumulation of amyloid-β (Aβ), which originates from the cleavage of amyloid precursor protein (APP), and hyperphosphorylation of tau protein, which leads to neurofibrillary tangle deposition. HSV-1 infection triggers APP processing and drives the production of several fragments including APP intracellular domain (AICD) that exerts transactivating properties. Herein, we analyzed the production and intracellular localization of AICD following HSV-1 infection in neurons. We also checked whether AICD induced the transcription of two target genes, neprilysin (nep) and glycogen synthase kinase 3β (gsk3β), whose products play a role in Aβ clearance and tau phosphorylation, respectively. Our data indicate that HSV-1 led to the accumulation and nuclear translocation of AICD in neurons. Moreover, results from chromatin immunoprecipitation assay showed that AICD binds the promoter region of both nep and gsk3β. Time course analysis of NEP and GSK3β expression at both mRNA and protein levels demonstrated that they are differently modulated during infection. NEP expression and enzymatic activity were initially stimulated but, with the progression of infection, they were down-regulated. In contrast, GSK3β expression remained nearly unchanged, but the analysis of its phosphorylation suggests that it was inactivated only at later stages of HSV-1 infection. Thus, our data demonstrate that HSV-1 infection induces early upstream events in the cell that may eventually lead to Aβ deposition and tau hyperphosphorylation and further suggest HSV-1 as a possible risk factor for AD. Livia Civitelli and Maria Elena Marcocci contributed equally to this work. The authors acknowledge Dr. Katarina Kågedal for critically reading the manuscript and Dr. Salvatore Fusco for his valuable technical advices. This work was supported by grants from the Italian Ministry of Education University and Research (PRIN2009PM9B33 to Anna Teresa Palamara and Claudio Grassi and PON01- 01802 to Anna Teresa Palamara). All authors, Livia Civitelli, Maria Elena Marcocci, Ignacio Celestino, Roberto Piacentini, Enrico Garaci, Claudio Grassi, Giovanna De Chiara and Anna Teresa Palamara, declare that they have no conflict of interest.